WIN--------->MOON: Comet holmes losing its tail....!!! Here we could see the comet named holmes losing its tail as seen by as seen by the British telescope SuperWASP. Normally faint comet erupted into its largest outburst in a century last October, which is when the robotic SuperWASP on the island of La Palma just happened to be pointing towards Comet 17P Holmes. Within two hours of its first sighting, Holmes outshone the telescope's "eyes" and prevented accurate measurement. 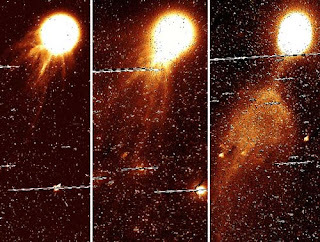 Here the images show the comet on November 3, November 6, and November 14, as a tail develops and eventually detaches as a large chunk of frozen gas and tiny solid particles. Astronomers remain mystified by this outburst of comet material, which reflected extra sunlight to make the comet one million times brighter than normal.